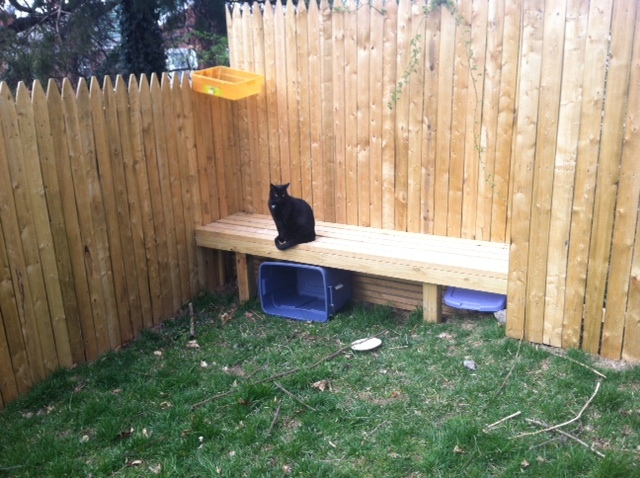 Jean Claude inspects CCL’s new backyard security measures to keep him and Koko in the yard. Koko and Jean Claude really enjoy their time outdoors at CCL’s new house. Unfortunately Koko really wants to explore the neighborhood and has found several escape routes. CCL has attempted to block the free spaces in her backyard with plastic containers and has installed a warning system (the orange plastic container at the top of the fence). No matter. Yesterday afternoon, Koko managed to escape to her nextdoor neighbors yard and quietly returned when she was ready. Posted in Inspirational, Life, Pets and tagged animals, Cats, fun, humor, inspiration, movies, pets. Bookmark the permalink.